I'd like you to meet "Blossoms", a fun and versatile pattern that uses two packages of 10"-squares stacks, or 75 10" squares in total. The quilt pictured above uses two 10"-square stacks of Veranda, my new pattern line from Robert Kaufman, which ships in August. The sample pictured above was with the help of my mom, daughter, and son. 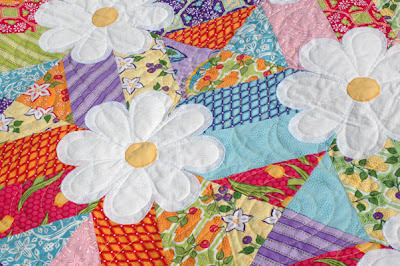 The ladies traced the applique onto fusible web, fused the petals, pressed, band drew diagonal lines when needed. Our son was in charge all destructive activities i.e. stabilizer removal. I manned the sewing machine. Thank you, assistants! Deborah Norris, of Deborah's Quilting in Gastonia, NC, did a beuatiful job quilting this, echoing the blossom chapes and covering the back with swirls and leaves, don't you think? Happy sewing and thanks for listening to me ramble! You've done it again! What a gorgeous pattern. Thanks for listing out the additional helpers, puts a girl at ease with feeling all lowly and unproductive. This is lovely. I am going to share this page with my 13-yr. old granddaughter. she is next in line for a quilt and this is right up her alley. Thanks for sharing, I am looking forward to purchasing this when it is available. AMAZING! I love the design, I really do! 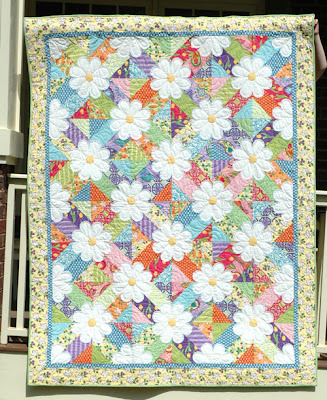 I am not a quilter (other than not having the space or patience for big projects I have 3 kids under 5 - 'nuf said!) 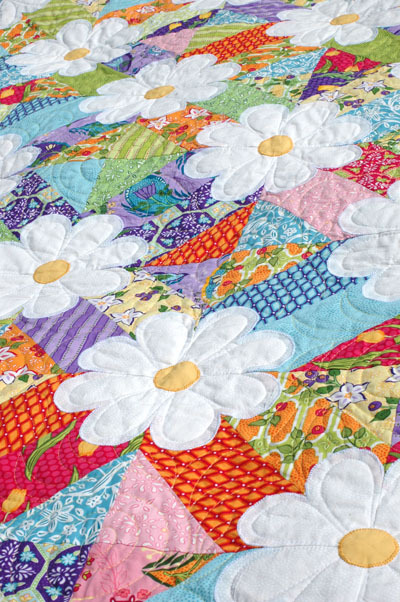 I would LOVE to snuggle under this quilt sooooooo much! I can't wait for this pattern! I like all your new ones, but this is my very favorite. I'm keeping my eye on FQS so I can order it as soon as it is in stock! this is STUNNING!! 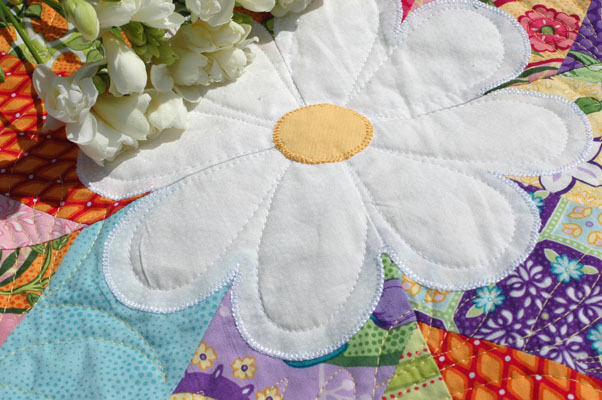 two of my favourite quilt features...scrappy and flowers :) I will be keeping an eye out for fabric and pattern.."shameless self promotion"? ?...I think, "Thankyou for sharing!" This is a beautiful pattern! I can imagine it in my future little girl's room. How wonderful and cheery! Jackpot Amanda!! !, that has touched the sweet spot, it's just right! I love the generous daisies, they sit pert and pretty on such a gaily coloured diagonal background. 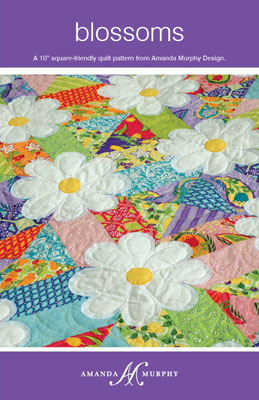 It's a super design for a summer quilt! You are such a talented, gifted woman..love your new pattern!! I can imagine it in so many color schemes, your idea for a christmas quilt is great!! Looking forward to making this, also love the other new ones.. This is the pattern my granddaughter chose for me to make for her. She liked them all but this is hands down her favorite. I will contact my store and ask her to carry it. why was this pattern updated, was there something wrong with it? ?